“Peace on earth, goodwill to men!” That is what the angels promised, was it not? I doubt that the shepherds fully understood what was meant by that message, but I believe that they heard one word very clearly: Peace. Shalom. That word rings in our hearts, and the song of the angels has been ringing down through time. We all possess a vast, spiritual longing for peace. We see that longing every Christmas. One of my favorite questions to ask people at this time of year is, “What would the perfect Christmas look like for you?” Maybe that picture includes snow, like it did for composer Irving Berlin. Maybe that picture involves a holiday tree with lots of presents underneath. Maybe that picture centers around family, everyone in good health and happy. Christmas becomes a journey every year to find that peace. Those shepherds had a picture of peace too. As uneducated, rough-hewn peasants, maybe they still grasped more about peace than we do. Maybe peace on earth was something that they would run to find because they knew how elusive it actually is. I know something about this, because in my life, I have been a shepherd too. 1) Peace is not based on our circumstances. “There were shepherds living out in the fields.” As I read that in the comfort of my own home, it sounds so idyllic and pastoral. Living out in the fields—getting back to nature. Not so. Living out in the fields was a regular part of their job, but these shepherds did not make their homes in the fields. It was a seasonal thing. It might have been lambing time, and perhaps they were out in the fields to assist the ewes in giving birth. This might sound peaceful, but it undoubtedly would have been the most disagreeable and least peaceful time of their year. When I was in junior high, my family built a house out in the country. When we got tired of cutting the grass, my dad decided that we should get sheep to keep the grass down. We were in for a rude awakening, and learned a lot quickly. For one thing, we learned that you can’t put the ram with the ewes and not expect nature to take its course. We looked out the window one morning and much to our surprise, there were black lambs scampering around the field. That was our first experience of lambing, but let me tell you, it got much harder after that. One night, one of our ewes was struggling in giving birth, and so my oldest brother was awake with them all night. One of the lambs was born dead. Well, I came home from school, and five minutes later, my neighbor comes over with a baby lamb in his arms. He said, “We found this one wandering around the field and shivering in the cold.” Apparently it wasn’t dead after all, but its mother had rejected it. So, I take the lamb into the house, and as he walks around behind the couch, bleating plaintively and smelling everything, I call my brother at work and ask him what to do. He says, “Oh, I’ve read about this. You have to wrap the lamb in the placenta and offer it to the mother, and you need to do it right away.” My mouth dropped open as I dropped the phone on the floor. Right. Like that is going to happen. I didn’t even know what a placenta looked like, but knowing what I know now, I’m pretty sure that I would have died before I would have picked it up. I never did find it. Imagine me running around that field on a cold afternoon, lamb under one arm like a squirming football, dodging the ram and trying to catch the mother so that the little lamb could nurse. If your peace is about your ability to control your circumstances, or even control your attitude towards your circumstances, then you have no peace. 2) Peace comes with a secure hope. “This Savior is Christ the Lord.” What was presented to the shepherds in this message of good news was simple—it was hope. They were presented with hope, and there was a concrete focus to it. A savior was someone who would intervene in their lives. A savior was someone who could deliver them from their enemies, who could bring that elusive peace. Hope is the foundation of peace. Christ was a name that they would have known. It meant “Anointed One.” It was not the last name of Jesus, but rather, a title of royalty and a secure hope for peace. It was a promise that God would visit His people to deliver them and to dwell with them in peace. It was a picture of harmony with God. Peace on earth didn’t mean goodwill between men, but the favor of God’s presence among men. So, the rest of the story. 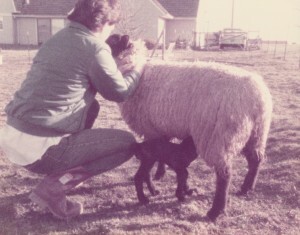 I ended up being the adopted mother of that lamb. 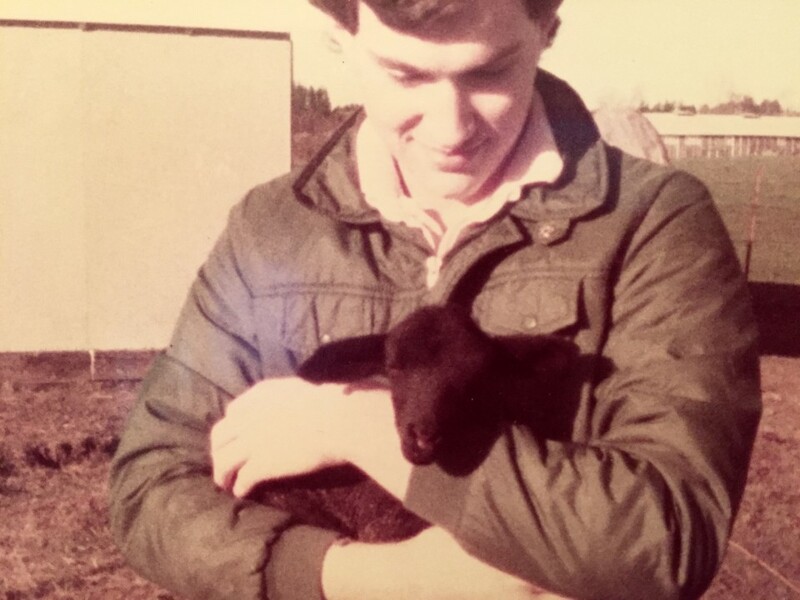 I had to catch the mother several times a day so that the lamb could suckle, and this was in December, and it was really cold outside. I was in high school at that time, and could only do the job so well. I wasn’t a very reliable savior. I wasn’t a secure hope. One of the things that made it even more challenging was that the other sheep were mean to him, and would shove him out of the barn into the cold. Honestly, there is a lot of that going on in the world today. One cold Sunday afternoon, I came home to find the lamb huddled outside against the barn, shivering to death. So I brought him inside the house and tried to warm him up, but that was the beginning of the end. He ended up catching pneumonia, and I tried to take care of him, but I couldn’t save him. When you hear that death rattle in the lungs of a dying creature, it is the sound of hopelessness incarnate. I wasn’t emotionally strong enough to stay with him through that death process. I went upstairs in our house, closed my bedroom door so that I didn’t have to hear him struggle, and just wept as my other brother held him in his last moments. You can try to manufacture peace. You can try to control your surroundings so that nothing disturbs your sense of inner peace. You can try relaxation techniques to manage it, but at the end of the day, you won’t find lasting peace. You have to put your hope in something if you want to have real peace. And wherever you place your hope—that is your foundation for peace, for better or worse. 3) Peace will require a journey. “Let us go now to Bethlehem to see this thing that has come to pass.” It is interesting to me that the shepherds went immediately to Bethlehem. They didn’t wait for morning. There was a sense of urgency to the journey. Remember that it was lambing time, and so leaving the flocks would have been a gamble. Why did they leave in such a hurry? When there is a real promise of peace on the table, it won’t wait. When peace looms large in our lives, we don’t waste time. Ironically, the shepherds left their flock to locate another lamb, a lamb that would become the Savior of the world. As the prophet Isaiah foretold, “He was wounded for our transgressions, He was bruised for our iniquities; the chastisement for our peace was upon Him, and by His stripes we are healed.” The way that God made peace with men was not in the cradle, but in what Jesus did on the cross. In my life, I find that I am another kind of shepherd now—I am a pastor. I see people chasing after peace all the time, particularly at Christmas, trying to build upon a foundation of hope that won’t support any weight. I feel that impulse in myself as well. We know deep down that peace on earth exists—that peace is possible, that is—but we don’t know exactly where to search. Christmas is a journey to find peace, but it is not the peace of a silent night. That kind of peace is easily shattered by circumstances. I think that the shepherds knew that. But they could recognize a true hope, and were not dissuaded from the hassle of the journey. If you follow the road to Bethlehem, it will take you all the way to Calvary, and that is a journey that is worth taking. It is a journey to find peace. Beautiful! Thank you for the reminder — of the time and of the meaning.